A little trivia today. Did you ever wonder where the phrase "safe as houses" came from? If you might recall the story of the "Three Little Pigs" not all houses are completely safe. Lessons we learned: straw and sticks do not make good houses. Brick, however, is sturdy and safe, and will withstand the huffing and puffing of a wolf. And, if I may put my faith in wiki-answers, brick-built houses are part of the reason that this phrase was coined. However, another reason they give is that, "when investment in the railways turned sour in the 1850s, people returned to investing in bricks and mortar, hence the phrase 'safe as houses'. " Today, homes that are neither straw, nor stick, nor brick. 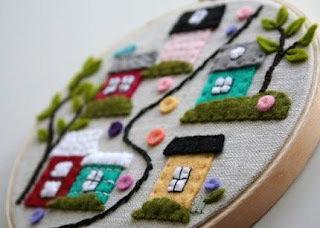 From LittlePinkHouse, a small neighbourhood handcrafted on linen using cotton, and wool felt, with hand-embroidered details. 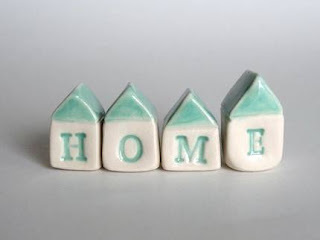 From thelittlereddoor, a quartet of clay "HOME" homes. 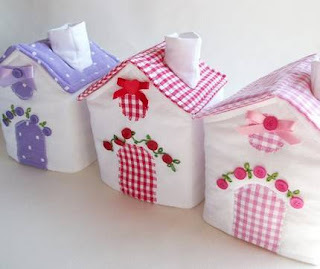 From BirdCraftsShop comes these plush fabric houses, which keep your tissue boxes cozy. From terrariooms comes this sweet little (only 3 inches high!) 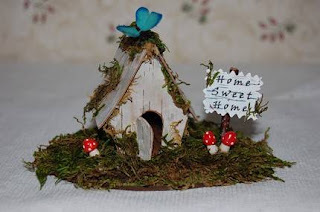 birchbark cottage. 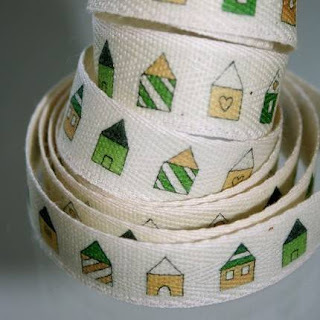 And finally, from lillalotta comes this perfectly adorable cotton tape/ribbon, decorated with a row of whimsical houses. Wouldn't you love to move into any of these little neighbour hoods? I am IN LOVE with the first picture from LittlePinkHouse! I don't usually enjoy crosstitch or embroydery on hoops, but this is completely different! I only very recently started enjoying embroidery on hoops. There are some wonderful aritsts who have given it such a fun and modern twist.